It is important to develop your ability to study imaging and correlate it with brain structure and function. 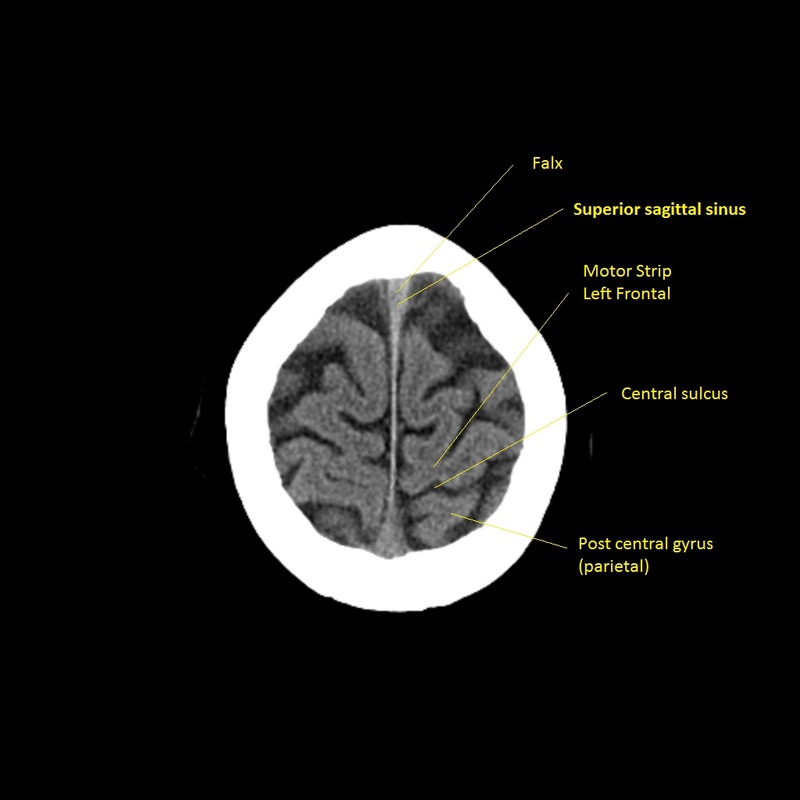 There is a standard anatomical vocabulary with terms such as axial, sagittal and coronal which are commonly used in both CT and MR to describe different cross sectional images. Modern day imaging actually allows the brain to be imaged and reconstructed in any plane but these are the standard and familiar views. Look at as much brain imaging as possible, the ones that you request and more. The key is to see a wide variety of normality and to build up some pattern matching skills and experience in identifying important structures and lesions. You will have an advantage over the radiologist who has only the clinical details on the card whereas you have the patient. Make sure you understand the terms axial, sagittal and coronal. Axial is simple horizontal slices from above down. Sagittal is in the same plane as cutting the brain in the midline or parallel to this (parasagittal). The falx cerebri that separates the brain hemispheres lies in the sagittal plane. Coronal is the plane of my daughter's hair band. A bit like a tiara or 'corona'. It is vital to have a good inner representation of the cerebral vessels as the enter the skull and join the circle of Willis and the circle of Willis as well and the position of the vessels. A few simple points will help greatly. The circle of Willis (COW) is at the level of the midbrain. Find the midbrain and then look for the vessels. This is a good place to start looking for the hyperdense MCA as the MCA leaves the COW laterally within the sylvian fissure. Starting with imaging. It is important to take your time and go through each slice from top to bottom in every case. Don't be distracted by the most obvious "big" finding and make sure you take time to ensure that you don't miss things. This is even more important in thrombolysis cases where the main concern is "is there any blood" and great care must be taken in what is a time pressured environment. 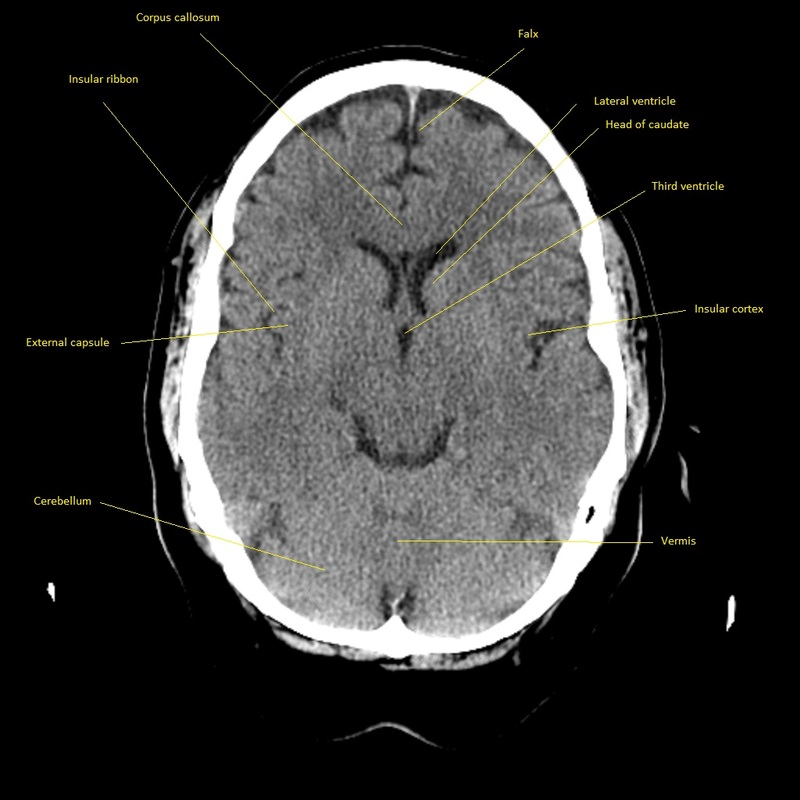 In that situation I look at the scan whilst it is being done in the CT and then as soon as the patient is out and before we give open the Alteplase I will go off to a monitor away from the team and distractions and quickly go through all the slices without interruption at least twice. As I have become more experienced and seen more and more cases I think this level of care is important. Its one of the reason why I don't rush to give Alteplase in the CT scanner as the control room is not the best place to look at a scan with diagnostic quality. I feel that several minutes quickly reviewing the scan in a controlled way is important especially in patients where things may just not seem clinically right. In most cases we do not get a radiology review before lysis. I will actively look for any suggestion of a thin layer of subdural blood or any hyperdensity that might reflect acute bleeding. 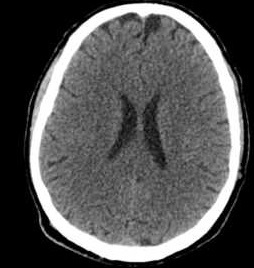 Sometimes it is difficult if there is asymmetrical basal ganglia calcification that can mimic blood or it may actually be blood. 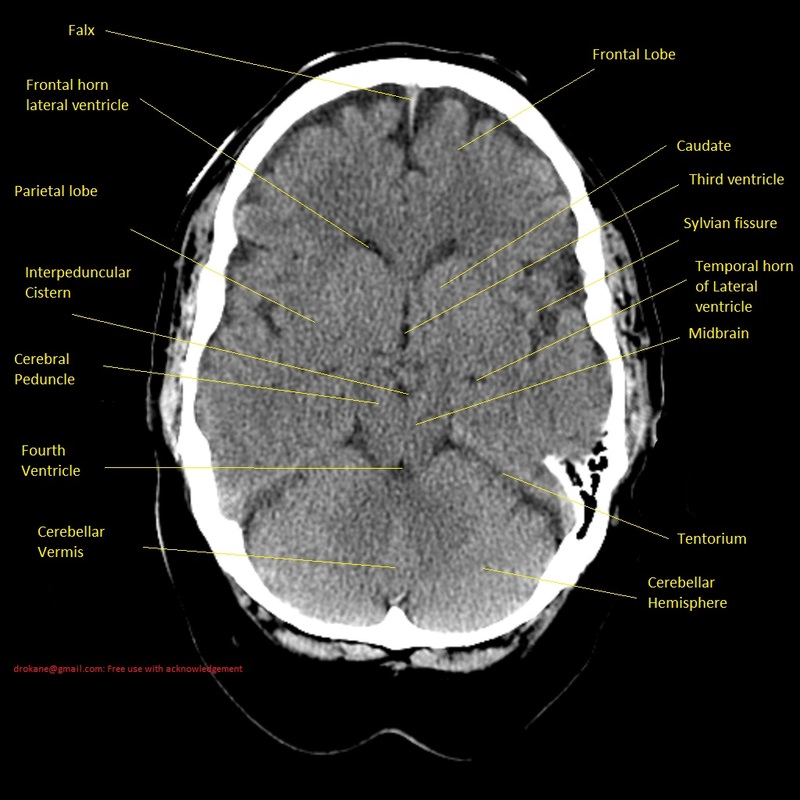 I will take particular care to look for any subarachnoid blood within the ventricles and cisterns as well as convexity blood in the sulci. I have seen excellent colleagues caught out with very subtle basal ganglia blood that looked very much like calcification even when shared with the neuroradiologist and also subtle sulcal convexity blood probably due to cerebral amyloid. 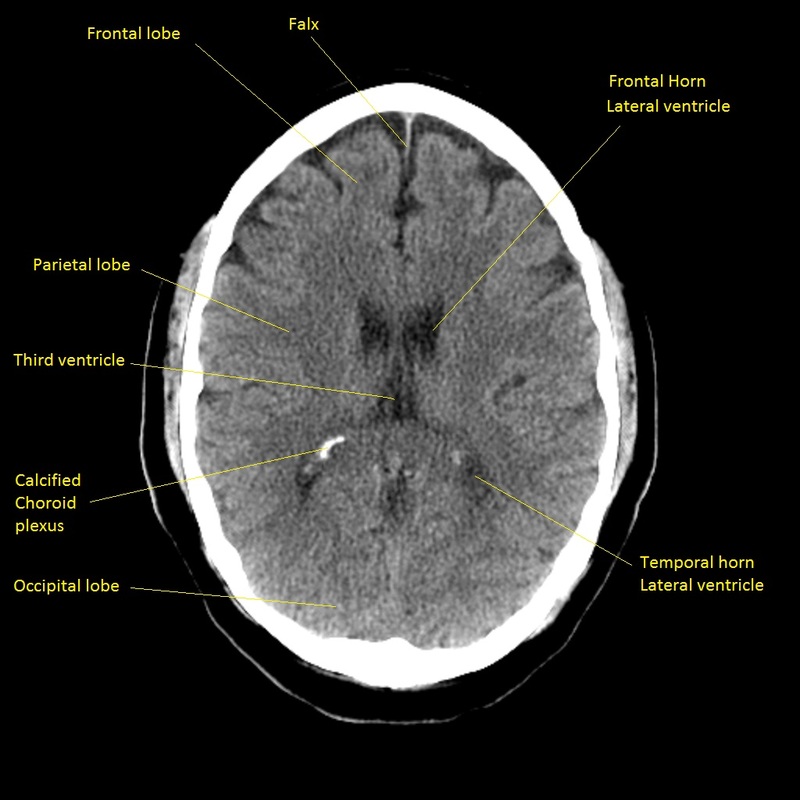 One possible clue is that often the NIHSS if the neurology is due to very subtle haemorrhage is usually in that low threshold to treatment range. The rest of the time scans can be looked at with time. It is very important whatever stage you are at the look at every scan. It may not mean much at the start but you are building up your own visual memory bank of imaging with which to compare every new scan and it quckly trains your visual skills. 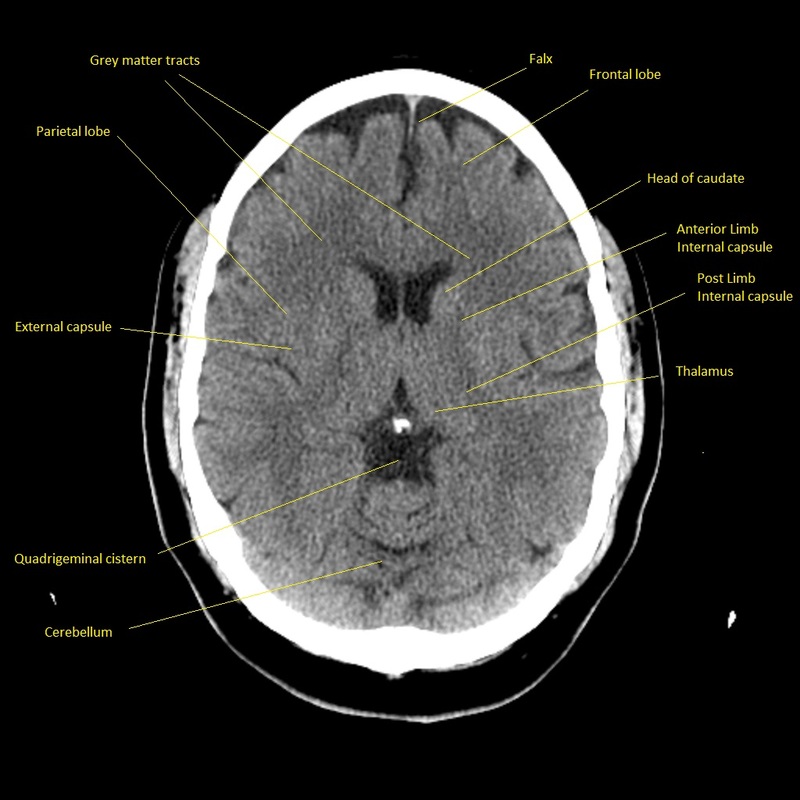 Image below:The top image two slices here are useful for just ensuring that there is no subdural blood or any other abnormality. It is on the top few slices that we may see a subtle anterior cerebral artery infarct that can have caused contralateral leg weakness and these slices must be looked at very carefully. It is important to recognise calcification of the choroid plexus which is within the ventricles and produces CSF. It is possible to get focal haemorrhage up at this level. Each slice needs careful review. Image below:A good view to look for any evidence of parenchymal abnormality in the cerebral hemispheres. Here we have brain supplied by ACA, MCA and PCA. 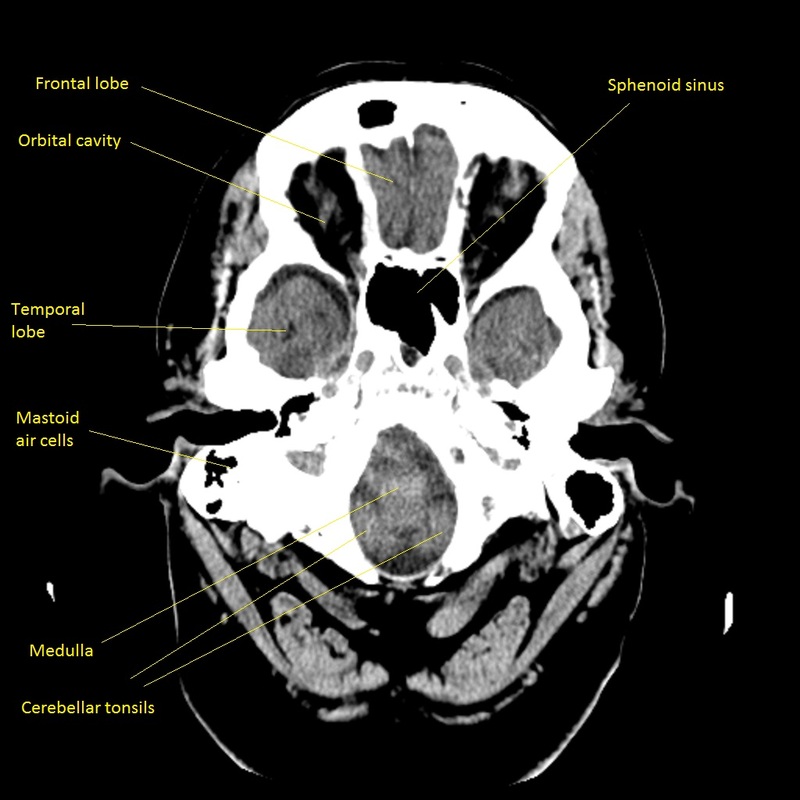 Look for any asymmetry and look closely for any space between the parencyma and the inner skull that could be a subdural. Appreciate the contrast between the outer grey matter an the more central darker white matter. Image below:A good view to look for any evidence of parenchymal abnormality in the cerebral hemispheres. You can also see the frontal and temporal horns of the lateral ventricle and the slit like third ventricle. Any enlargement of these particularly the temporal horns can suggest hydrocephalus. Image below:This is the level going through the Midbrain. Identify the V shape of the midbrain. This is formed by the cerebral peduncle which carry the descending motor fibres in the front of the "V". 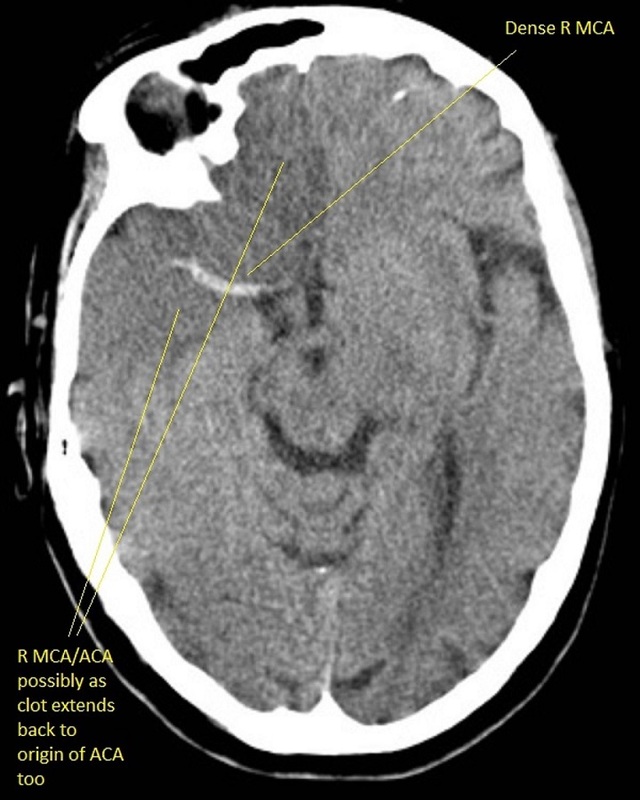 This is a good position or a slice above or below to see the branches of the circle of willis and this is often the level at which one can see clot "the hyperdense artery sign" within the MCA or even PCA. 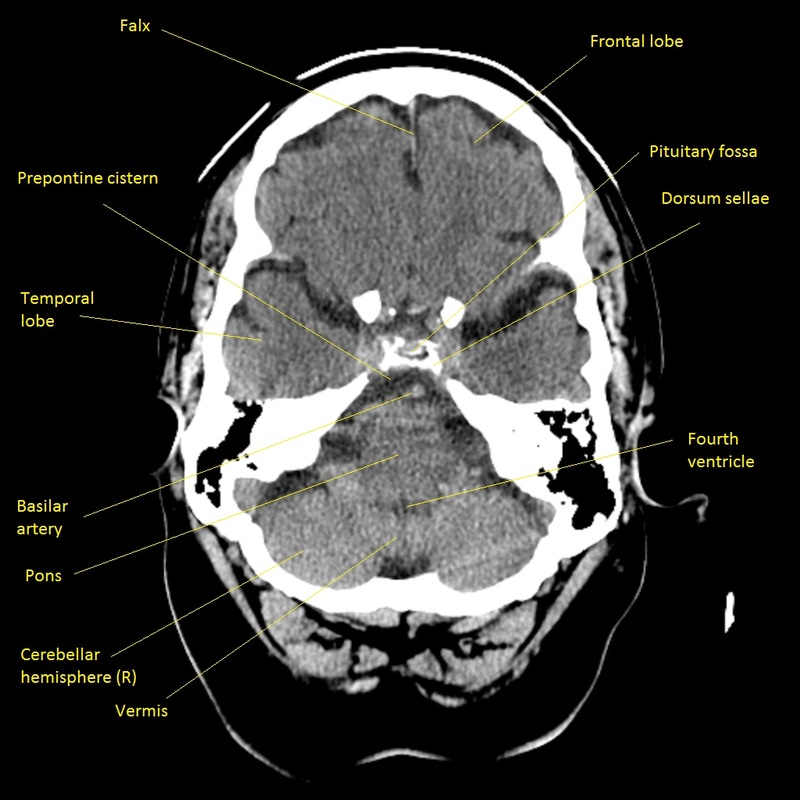 You can also see the frontal and temporal horns of the lateral ventricle and the slit like third ventricle. Any enlargement of these particularly the temporal horns can suggest hydrocephalus. Image below:This is the level going through the Upper Pons. As you can see the pons is a slightly rounded structure with the cerebellum attached posteriorly seperated by the fourth ventricle. This a common area to contain blood in those who have had bleeding into the centricular system. 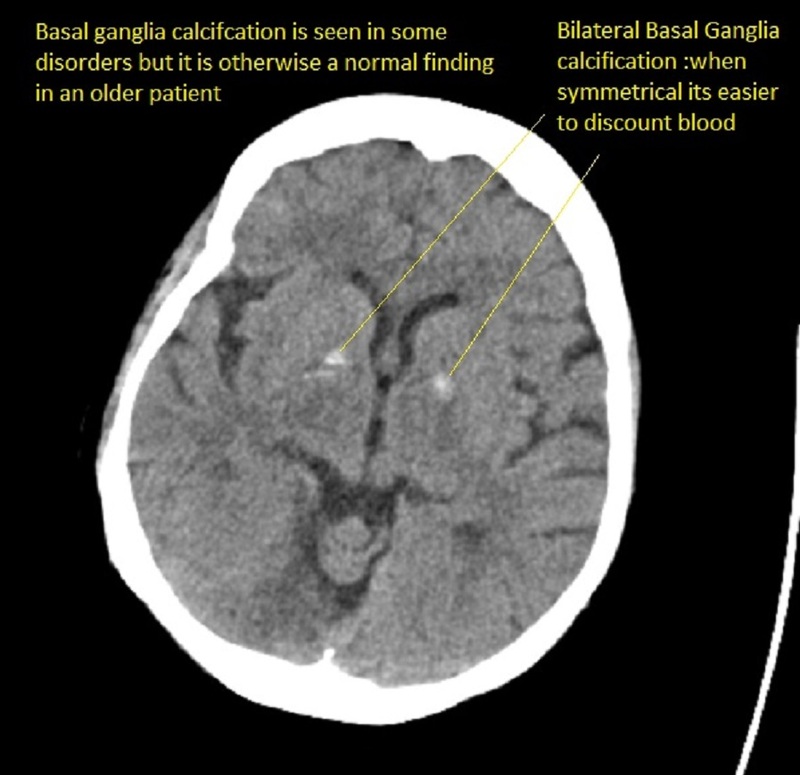 Some degree of basal ganglia calcification is normally seen and the main issue is to differentiate it from blood. There are extreme variants and the so-called Fahr syndrome. Normal calcification is seen in middle age and beyond. Unless extreme it is rarely associated with any problems. 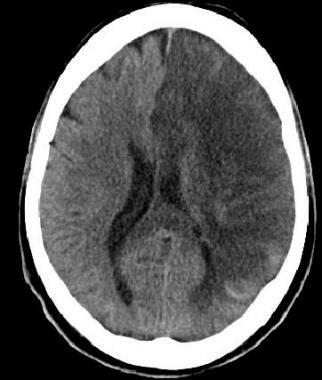 This can be the earliest sign of a large vessel stroke if accompanied by a corresponding Left MCA stroke syndrome. 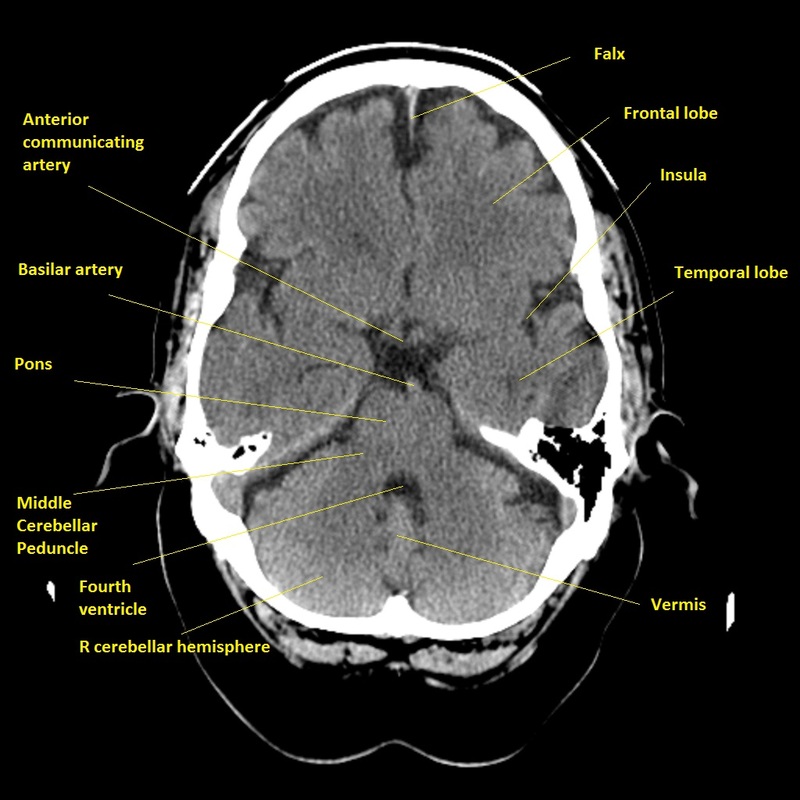 There are no obvious tissue changes and the patient if within the window and NIHSS is raised and no contraindications should be considered for thrombolysis / thrombectomy if safe. Occasionally due to good collaterals theremay be minimal symptoms and in others they can be profound. A dense artery may just be calcium in the vessel wall and scans must be interpreted within the clinical context. The patient was comatose and sustained massive damage to the posterior circulation. 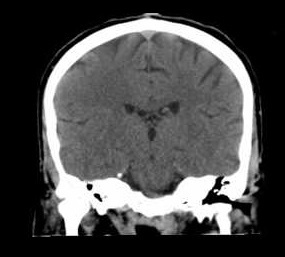 This is an important sign in a deteriorating and comatose and quadriplegic patient needing consideration for thrombectomy. There are no parenchymal changes seen yet. Loss of insular ribbon sign is similar to loss of grey white differentiation with localised cytotoxic oedema. Vascular supply here is more vulnerable due to poor collateralisation and so this may show first. 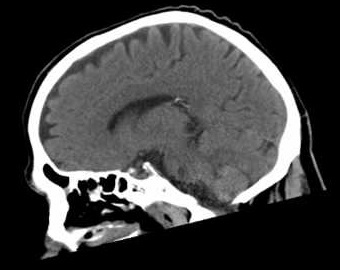 Hypoattenuation seen on CT is highly specific for irreversible ischaemic brain damage and infarction if it is detected within first 6 hours. Hyperdense MCA sign or more distal MCA "dot sign" it may be normal is a sign of clot (thrombotic or embolic) (not a contraindication to lysis) but shows extent of possible infarct which depends also on collateral flow. 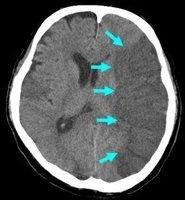 This shows an evolved subacute infarct as the edges are still indistinct and so there is ongoing liquefactive necrosis. This is about Day 2-4 or beyond. There is some mild midline shift due to some localised oedema. 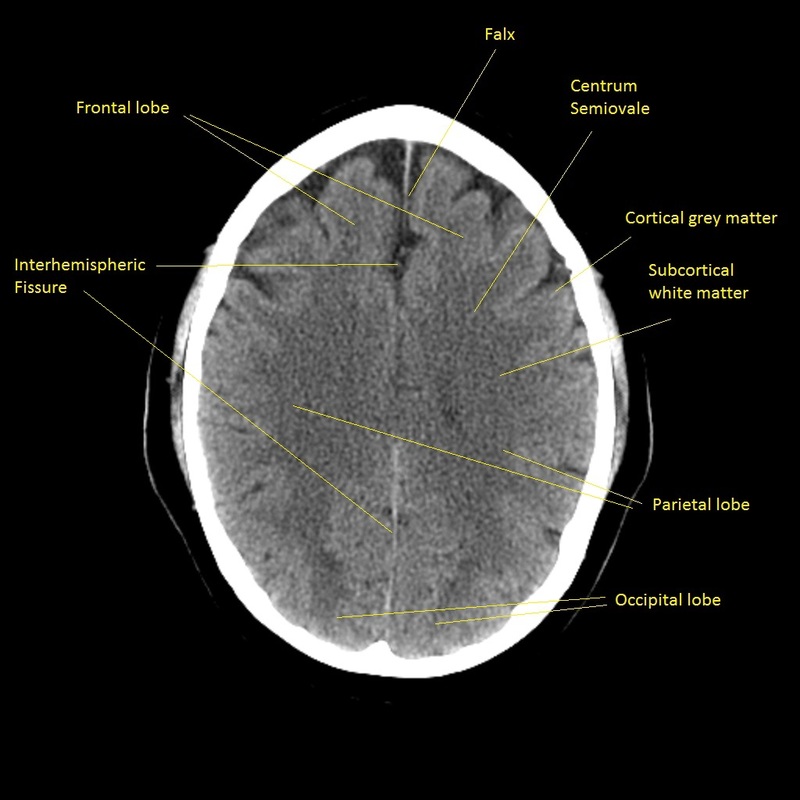 Infarction involves both occipital lobes. The patient who survived is blind. There is no bright white fresh blood so this is a subacute bleed and it can be surprising how well these are tolerated. The midline is shifted. This is not stroke. It needs urgent discussion with neurosurgeons. Any anticoagulants or antithrombotic therapy must be stopped. The decision on whether to operate will depend as well on the clinical state of the patient. 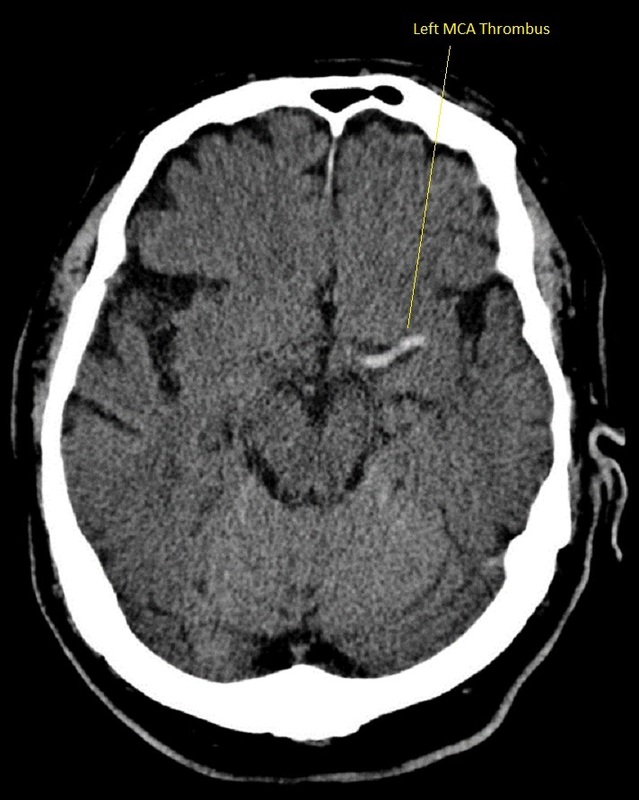 Clearly delineated wedge shaped hypodense region involving cortex and adjacent white matter related to the occluded artery anatomy and collaterals at 12 hours. May be some haemorrhagic transformation. Estimated incidence of haemorrhagic transformation is up to 40% in the subacute period even when not thrombolysed. 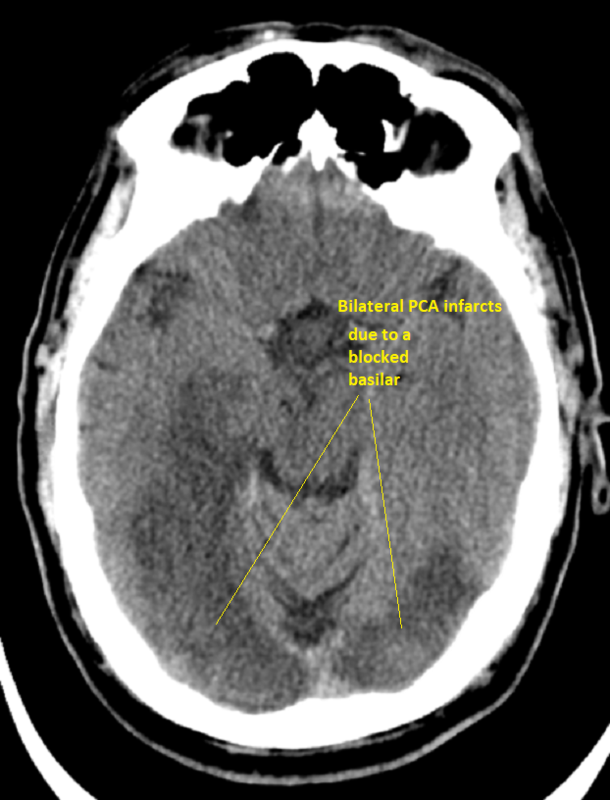 Lacunar infarcts may be seen deep within white matter and within the basal ganglia. 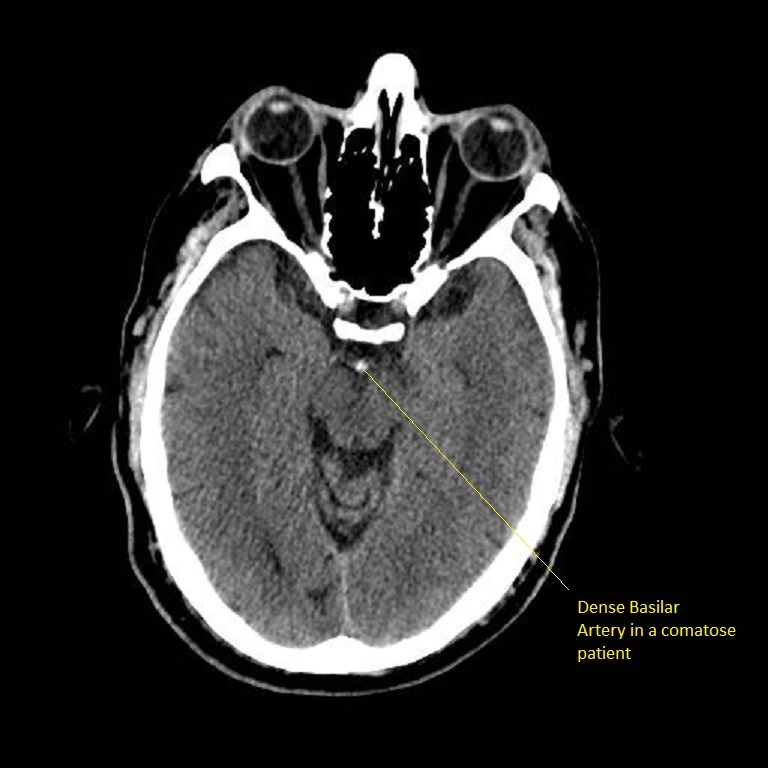 Occasionally due to collateralisation or perhaps reperfusion of the MCA the cortex remains unaffected but subcortical areas infarct and become hypodense and this is seen with a subcortical striato-capsular type of stroke. Late changes over days and weeks is most marked Hypodensity due to cytotoxic oedema initially and Vasogenic oedema secondarily and best seen days 3-10. Late changes over weeks and months shows continue as the infarcted zone has density of CSF and there is loss of volume. A hypodense caudate suggests MCA occlusion proximally taking out lenticulostriate arteries. 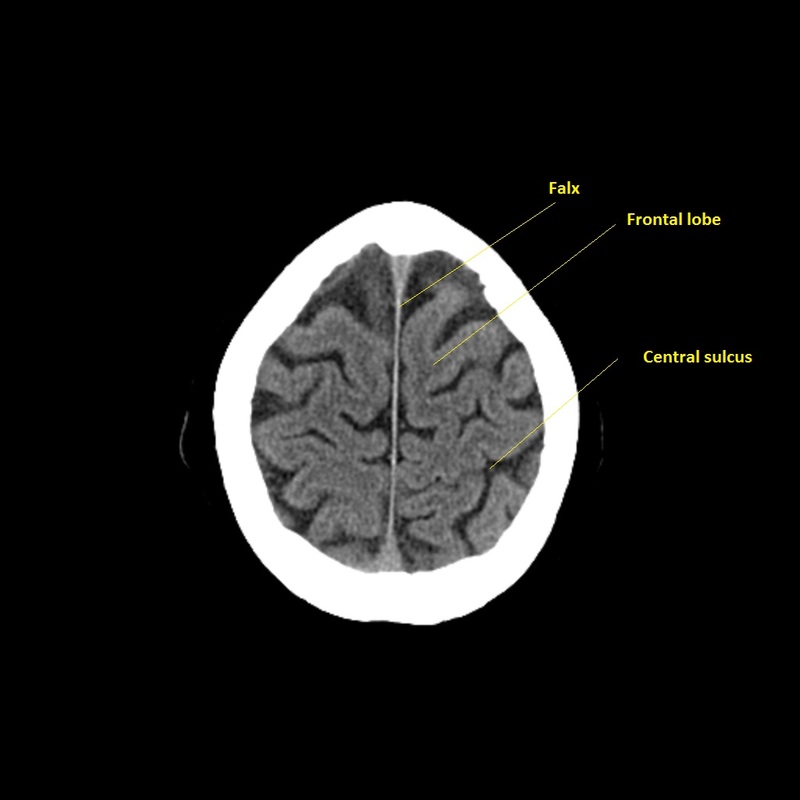 Non contrast CT false negatives (there is a stroke) usually in infarcts when done early or in those who present 7-10 days after stroke and there is a visible hypodensity but no blood and so aetiology of perhaps a small bleed may be missed. 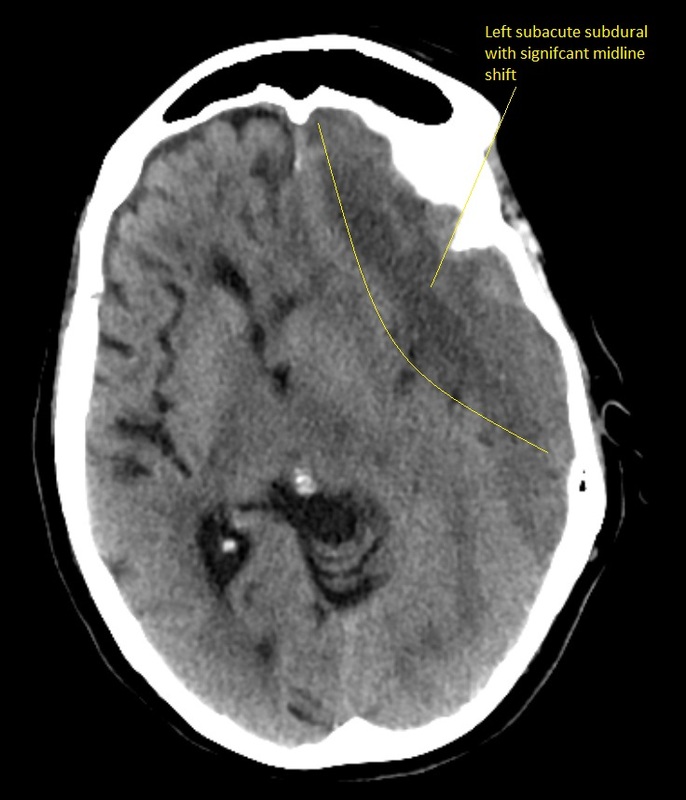 In these cases a gradient echo will show haemosiderin deposition around the margins suggesting haemorrhage as he cause. 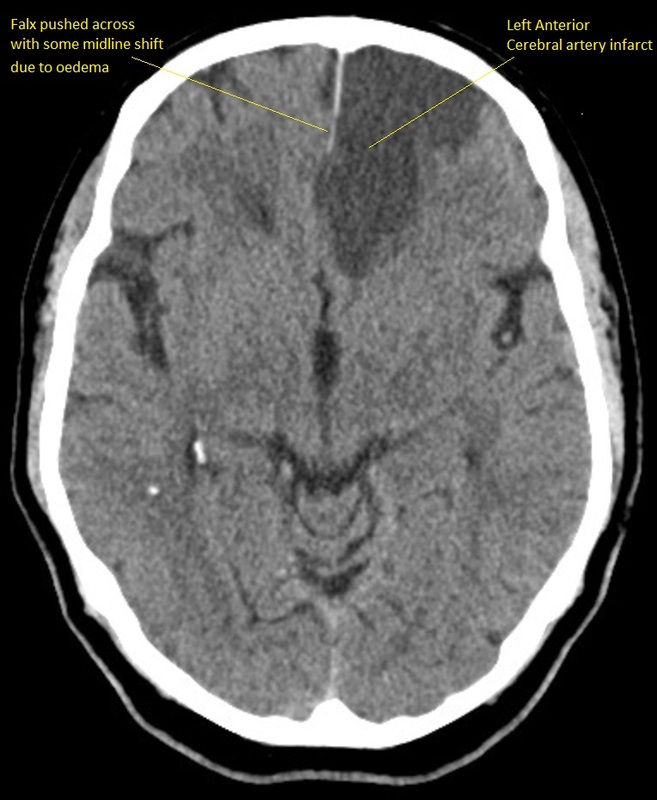 NCCT false positives are seen particular in older hypertensive patients where Lacunar infarcts are common and most often asymptomatic but appear on scans done for a myriad of reasons so unless there is corresponding new neurology do not diagnose acute stroke but do treat for "stroke disease".